Crab Team Program Assistant, Kelly Martin, will be presenting at Storming the Sound, a conference for environmental educators in the north Puget Sound region. 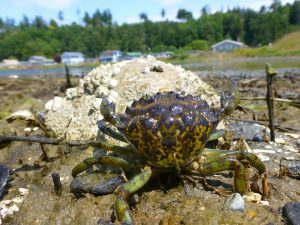 Originally introduced to the west coast in the late 1980s, invasive European green crab, Carcinus maenas, has posed a threat to ecosystems of the Pacific Northwest for decades. With the recent expansion of green crab into the Salish Sea, there is increased concern over the potential impacts of a full-scale invasion in Washington State. In response to this development, Washington Sea Grant launched a volunteer-based monitoring program in 2015 focused on assessing the status and impacts of a potential invasion. This presentation will provide an overview of the history, threats, and current status of European green crab in Washington’s Salish Sea, as well as how the public can help monitor our shorelines for this infamous invader. Visit the Storming the Sound website for more information.